Festivities is a time to smile and rejoice. But the balancing act between family and work, seldom leave you with any space for yourself. Amid hectic schedules, stringent deadlines, and running errands, ‘my time’ becomes a luxury. So we suggest you change all this, this festive season and just opt to pamper yourself. After all, festivities are all about being happy and loving oneself. So go ahead and invest in yourself and here are some perfect ways of doing so. We understand how challenging it can be to keep the numbers stable on the weighing machine. But indulging in Diwali delicacies once in a while won’t harm. With the festive season in full swing, there’s a long menu of sinful desserts to choose from. Spoil yourself with a sinful chocolate cake, or a delicious brownie, or with a wide range of Indian desserts. You may also consider a quiet, leisurely brunch or breakfast in the morning or lunch with your girl gang at your favourite restaurant. Splurge on yourself and your better half with an excellent dining experience and treat yourself to luxury! The best part of being a woman of today is that you don’t always need to wait for others to buy you things, you love. So get frivolous and go out shopping. Buy that lovely dress you saw the other day or the new phone or laptop you wanted for so long. Just follow your heart and make yourself happy for a change. If you don’t have the time, then there is always online shopping to your rescue. Sit back and do retail therapy within the comforts of your home. From designer jeans to jewellery, everything is just a click away these days. 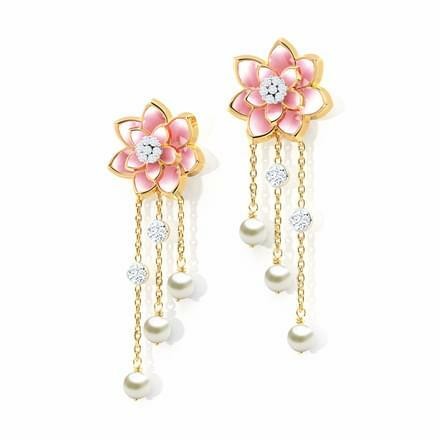 In fact, with Diwali round the corner is now best time to buy jewellery. To make things easier, we also browsed some jewellery options and found these beautiful set of diamond earrings at CaratLane, just perfect to wear at festive gatherings this year. So dazzle your way through the festivities with uniquely designed earrings complementing both your Indian and contemporary outfits. Enjoy your Diwali holidays by simply taking a break from everything. Just sit back alone or with your favourite girl gang? Download or rent a chick flick or simply switch on the TV and find one that is about to start. You may order a pizza or get a bag of popcorn to give an unconventional twist to your Diwali celebration. After all, doing girly things are sometimes the best therapy a girl can get. Time is said to be the ultimate luxury one can get. But in our busy schedules, we make all the time for everyone and everything except ourselves. So make it a point to pamper yourself and get some alone time. What you love doing during this time could be anything from - just sitting quietly, or reading a book, or contemplating your plans over a cup of coffee to cooking your favourite meal. If you want to relax in your alone time, then even a good spa treatment can do wonders! Consider getting a Thai massage which involves acupressure and Ayurvedic principles to loosen out those tight muscles before the spirited festivities start. How long has it been since you let your hair down and enjoyed a night out with all your gal pals? Most people love dancing as it makes it easy for them to forget about their worries. Get your friends together and go out clubbing. Hit the dance floor or just relax in the carefree atmosphere. If you are an introvert and loud noise is just not your thing, then choose a fun place for enjoying dinner instead. Trust us, once in a while, it simply helps. Diwali is all about seeking happiness. You can only make others happy when you are happy yourself. So step out, let your hair down and paint the down red.